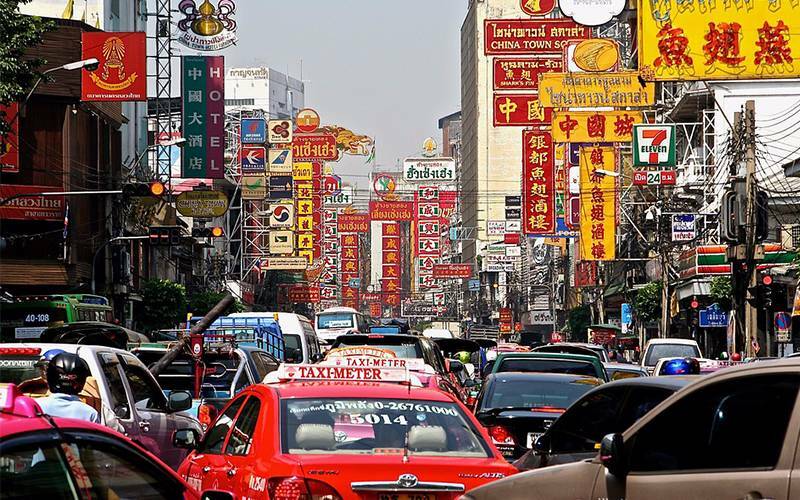 Welcome to Yaowarat, a place with all the trappings a real Chinatown should have. Yaowarat is a real definition of China itself. From the Chinese language spoken, to the Chinese signs found in the buildings, to the presence of Chinese temples. There are also Chinese restaurants that sell some of the best Chinese dishes, as well as stores that sell Chinese medicines. The sale of gold and amulets are not also left out as they all reflect the rich Chinese culture. Yaowarat is a Chinatown that is as old as history itself. In ancient times, it served as an area of settlement for Chinese immigrants and Thai-Chinese families starting around 1782. It was in this period that King Rama 1 moved the capital from Thonburi across the Chao Phraya River to Rattanakosin Island. This led to the movement of the Chinese in Rattanakosin to the south. These immigrants eventually settled in Yaowarat, now known as Chinatown. For a long time, Traders were commonly found operating from this area and trading between Thailand and China. In recent times, this place has become a site of major attraction for tourists and visitors. Although it is old, the streets are lined up with major attractions that make for great adventurous journey. If you are looking for goods in the lowest prices ever, you have come to the right place. There are so many things to shop for in Chinatown. There are small Chinese shops that trade in the sale of Chinese medicine. You can be sure to find practically anything in the stands and stalls erected by the road side. A major highlight is the Old Siam shopping center where you can find as much as the hands can grab, and all at affordable prices. You can shop for colorful fabrics, gold, rare gemstones and even Tupperware. Unlike the modern malls where you can't beat down prices, here is a chance to fully exhibit your haggling skills as the prices here are negotiable and you can often find the common phrase '“Tuk kwa nee dai mai?” (Can I pay less?) being commonly exchanged between sellers and buyers. You can also buy things in bulk and get them at really low prices. China is known for its temples, so you can be sure to find temples here at Chinatown. There are two temples found here. There is the temple of the Golden Buddha that contains theworld's largest gold statue. This temple is commonly known as Wat Traimit. The other temple is known as Wat Mangkon Kamalawat. 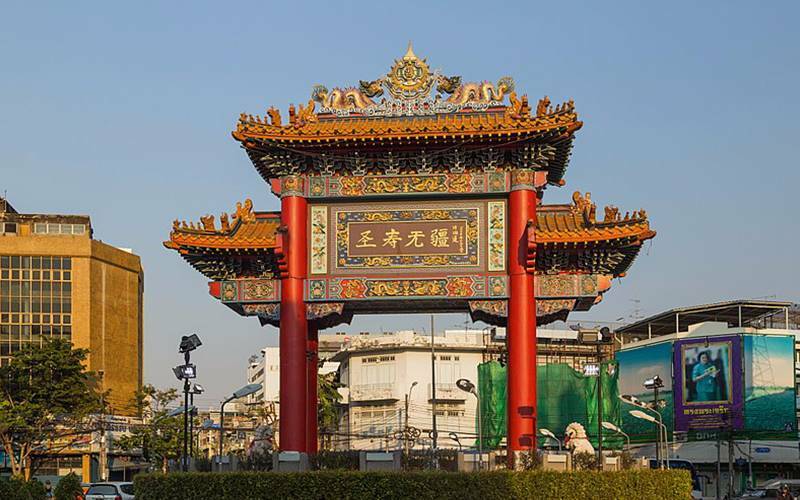 It was built as late as the 1870s and is Bangkok's largest Chinese-Buddhist temple. 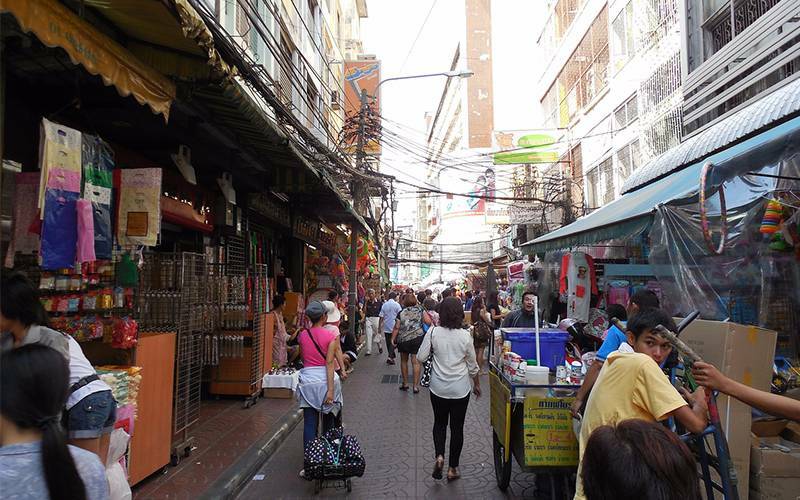 There is no better place that offers greater view of Chinatown as the well known packing district, Khao San Road. Located here are amazing bars in Restaurants that offer great and wide view of different attractions of the city. You can find the Sky View 360° Restaurant, located on the top floor of the Grand China Hotel. Here, you can see great views of the city and river. For lovers of music, they offer live music every evening that changes the atmosphere to match the city itself. Another great attraction is the River View Guest House. From its River vibe restaurant and bar, you can enjoy a wonderful view of the river. If you like continental dishes, you should definitely try out El Chiringuito. This Spanish themed bar offers Sangria, Spanish tapas and other Spanish inspired drinks. This should really be the first on the list. Chinatown offers so many Chinese dishes and they can be found in many stalls and stands around. If you are looking to sample rad na (gravy noodles) and pad see ew (soy sauce noodles), you should definitely check out The Jae Ouan Rad Na Yod Pak stand on Yaowarat Road. For those looking to sample guaythiew lod (pork stuffed flat noodles), the Guaythiew Lod stand on Yaowarat Road is the place to be. However, if you are more interested in hoy tod (oyster or mussel omelettes), then the perfect place to go is Nai Mong Hoy Tod on Soi Prapachai. Generally, Yaowarat Road serves as home to many street Restaurants that serve so many dishes ranging from Birds nest soup to Shark Fin soup. You should also try out the seafood on offer here as it is esteemed to be the best in town. In Chinatown, you can also find some river side cafés that offers great view of the rivers where you can see boats passing by. You can also find experts that are available to take you on food tours around the city. Click the following link and get ideas for your customized tour. You are probably wondering what the best and safest means of public transport around town is. There are taxis as well as buses which are numbered 7, 8, 37, 49 and 75 that will take you into Chinatown. The best mode of transport however, is to go by a river boat. This is because going by taxis and buses might result in you getting caught in traffic. To go by river boat, you can catch a boat at Tha Ratchawong Pier, which is just a few hundred meters walk from Yaowarat road and Sampeng Lane. From Saphan Taksin and Banglamploo Piers, you can get a boat ride that stops at Hua Lum Phong MRT (underground) station. From here, you cross the bridge at Hua Lum Phong train station and walk 5-10 minutes (300 meters) to the Commemorative Arch where Yarowat Rd and Charoenkung road start. Once here, you can start exploring the town on foot. 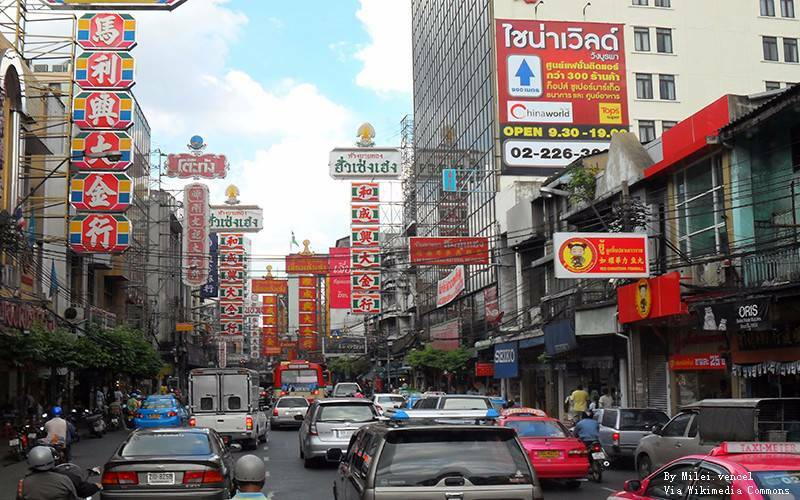 If you are planning to go to Bangkok or are already there, Chinatown on Yaowarat road is really one of the most interesting and fun place to be. Its nightlife and trappings is unrivalled. The many market and street stalls gives you a chance to mix with the locals and relate with them. Just by walking around, you can get a full experience of all the town has to offer. The best tasting meals offered will definitely have you going back for more.